AristoMig C300 and 300 are ideal partners when it comes to efficient production or prefabrication of high alloyed materials with a very high demand on the welding performance for materials up to 5mm. AristoMig C300 and 300 allows the choice of following processes; MIG/MAG, pulse MIG , MMA. The choice of processes is related to the different control panels. The power sources are based on inverter IGBT technology that provides reliable equipment with outstanding welding characteristics. The communications and control CAN-bus system means less cables, which in turn increases operational reliability. The power sources are optimised to operate together with the wire feed system AristoFeed 30L-4. The compact version has the feeder build in the power source. With separate version connection cables up to 15 m provides a wide working radius and together with all standard accessories as wheel kit, lifting eye it’s provide full flexibility. The TrueArcVoltage System, in combination with an ESAB PSF gun, guarantees that you weld with the correct arc voltage independent of any voltage drop in the welding cables. This means that you will get the same arc voltage and weld result either you have a set-up with short connection cable and 3m gun or a set-up with 15 meter working radius. AristoPendant U8* for advanced applications AristoPendant U8 support a quick access to synergic setting. More than 100 pre-programmed synergic lines are available. Welding based on pre-programmed synergic data reduce the preparation before start to a minimum. The memory provides additional functionality. The capacity to store up to 99 welding parameters which can be recalled when ever needed. A number of soft buttons with flexible functions provides direct access to Hot start, crater fill, 2/4-stroke etc. 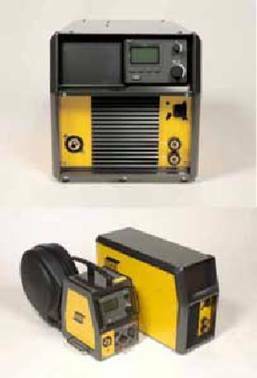 • ESAB LogicPump ELP, secures automatic start of water pump when connecting a PSF water cooled welding torch. • TrueArcVoltage System, measures the correct arc voltage value independent of the length of the connection cable, return cable or welding gun. • Aristo SuperPulse™, the welding process with the ability to control the heat input (AristoPendant U8).